One of the first bike sharing schemes was tried by Amsterdam in 1965, 500 free white bikes left around the city. But, this was not the most auspicious start. Bikes tended to soon disappear, and the scheme was later abandoned. Though, it is worth noting that this was a period where Amsterdam and the Netherlands saw a resurgence in cycling rates. 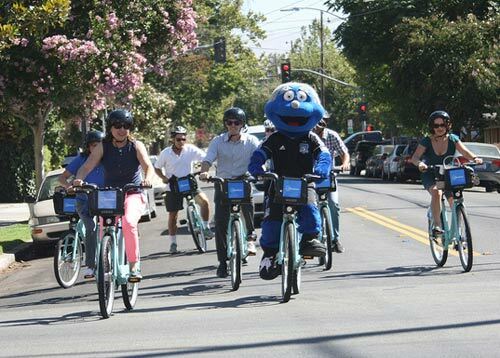 In the 1990s, some cities tried more serious bike sharing schemes. Denmark saw several cities pilot bike sharing schemes, with considerable success. Since 2000, there has been something of an explosion of interest. 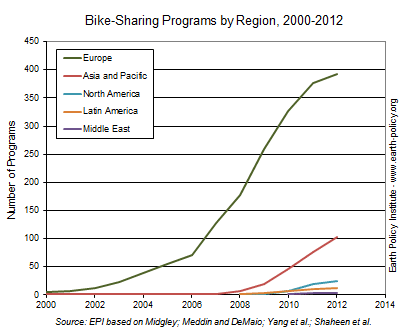 In 2000, just 6 countries had bike sharing schemes, by 2013, this has grown to 48 – and the number is set to grow. In the last two years alone, the growth has been significant. Between May 2011 and April 2013, it is estimated the number of bike-sharing programmes around the world grew from 375 schemes to 535. The total number of bikes involved rising from 236,000 to 5170,000. 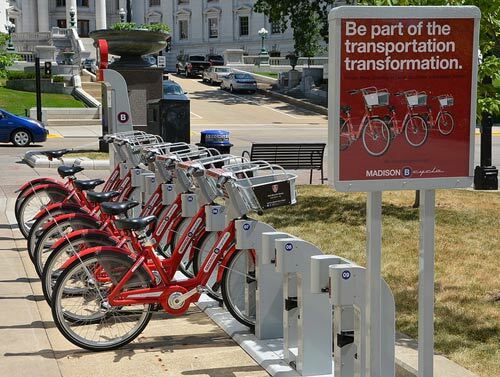 Perhaps the most influential bike sharing schemes were in the French cities of Lyon and Paris. Despite hosting the Tour de France, the culture of cycling in cities was at a low ebb in France, with only a small % of journeys being made by bike. The Paris Velo scheme was notable for its extent and number of bikes involved. It managed to create a critical mass of bikes, docking stations and publicity to attract a growing number of users. 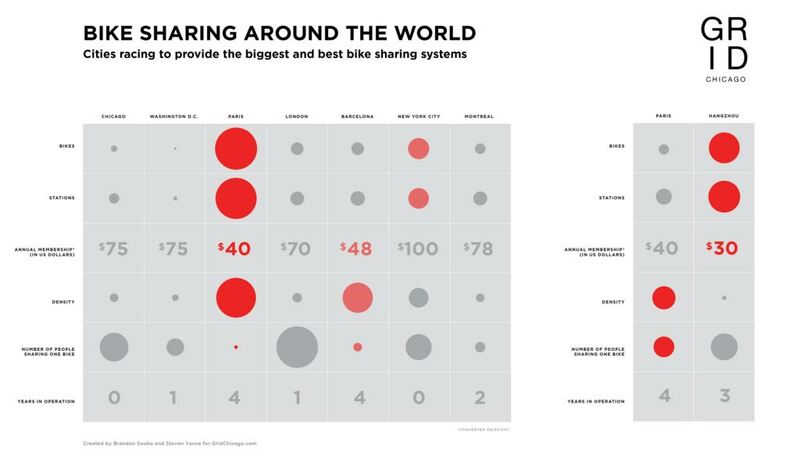 Paris Velo has the highest number of bikes per inhabitant (1 in 97) in the world. 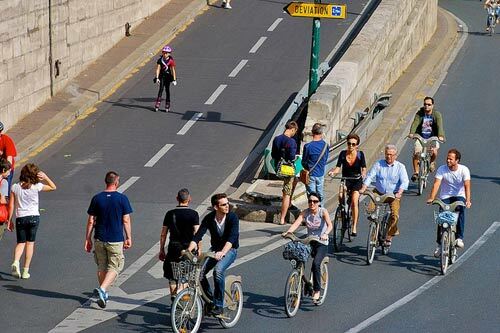 By its sixth anniversary, a total of 173 million journeys were reported, and a doubling of the number of people cycling in Paris. The main drawback of the Paris experiment was that vandalism and theft proved higher than expected. An estimated 15% of bikes went missing, leading the Paris council to have to offer subsidy to the Decaux advertising company to compensate for losses. The other drawback was tending to have a shortage of bikes on the top of hills. People wanted the ride down, but were not so keen on riding the 22kg bikes up them. Whilst there has always been a culture of cycling in Europe, the US has lagged behind, with one of the lowest rates of cycling in the developed world. However, bucking this trend, several major cities, such as New York, Oklahamo, and San Jose have adopted a scheme. Other cities like Los Angeles have schemes in progress. Though some of the more eccentrically conservative Americans see cycle hire as some kind of dastardly socialist plot, cycle hire use in Manhatten has been embraced by a wide social mix, including well paid professionals. Cycle Hire changing the culture of cycling? Cycle hire schemes have been a relative success. More than anything they have led to increased cycle use and made cycle provision in major cities an important political issue. Since the Second World War, bicycle use has often been marginalised, but cycle hire schemes have been a factor in bringing bicycle use back on to the agenda for sustainable transport issues. It helps that cycle use also contributes to other major issues facing cities, notably – pollution and congestion. Optimists may hope that growing cycle use will lead to a positive spin offs. More cycle users lead over time to more political pressure for better cycling facilities. If cities are able to improve basic cycling infrastructure, there is a real possibility other cities may start to see the kind of cycle rates that are currently only enjoyed by a few cities like Copenhagen and Amsterdam. Furthermore as more people start to cycle, there is the hope that the critical mass of cyclists will change perceptions and make drivers more aware of the presence of cyclists on the roads. 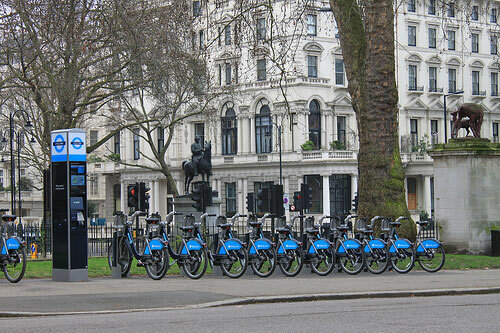 Less optimistic critics argue that cycle hire schemes can be well intentioned, but not a solution to the main problem – which remains a lack of safe and viable cycle lanes. For example, London cycle campaigners regularly criticise the capital’s bike lanes as essentially being little more than putting paint on the road. Putting up a few docking stations and bikes, doesn’t on its own make cycling any safer. Also, there is a big divergence in the type of scheme adopted. Really successful cities like Paris have an extensive number of docking stations, other cities are experimenting with just a small number. The remarkable feature about cycle hire schemes is their explosion in popularity in the past 10-20 years. From being limited to a few cities in Asia and Europe, few would have predicted the growth of cycle hire schemes across the world (especially US). Since the schemes are still fairly young, it will take time for a culture of cycling to be more firmly embedded in the cities. Cycle hire schemes are not a panacea, but they are an important step to promoting a cycling culture within a city. It remains to be seen whether the growth in cycle hire schemes continues, and also whether they can be sufficiently resourced to make them attractive to people who don’t currently cycle. But, even the most pessimistic cycling advocate has to admit the growth in number of schemes is a positive step. I like the optimism in this article. But I have to admit to being one of those who feels these schemes run the risk of being something of a red herring. Take the Bath scheme – http://www.bikeinbath.com. Launched in 2011 it has only four relatively central “stations” and the distance between the two which are furthest apart is a 15 minute walk. The equivalent ride would take you further due to the one-way systems in Bath. Admittedly the cyclist might be marginally quicker but I wonder how many people endure the cost and hassle to shave 5 minutes off a pleasant 15 minute walk across town. Of course you could go further than the next available bike station, but like Boris Bikes the pricing scheme is heavily biased towards short hire periods – the cost per hour increases the longer you have the bike. The scheme has only 52 likes and very little activity on facebook. I imagine it’s very hard to build high-quality consistent bike-friendly infrastructure around a city like Bath, especially in a country where the road-building regulations and manuals don’t give you many tools to work with. But if it could be managed, I would hope local residents would buy their own bikes and commercial sharing/hire schemes would appear to meet the requirements of tourists or occasional users. In fact there is already Bath Bike Hire which seems much more suited to a nice day out riding down the canal, or perhaps around the two tunnels circuit or along the popular Bristol-Bath railway path. I know I’ve rather picked on one example which is perhaps unfair. I’m sure bikeinbath is well-intentioned. But I imagine it’s also quite expensive and I’ve seen instances where cut-throughs in the area were being closed to cyclists at the same time as the bike-share scheme was being rolled out. Great post Tejvan. I was sceptical at first about the hire scheme coming to London but I know several people who are now cycling full time as a result of a cycle hire spin. Looking at that graph it seems London has the potential to grow too. I hear electric hire bikes are next, in my very borough. Looks like some more competition on those hill climbs! PS: that captcha is annoying! It either doesn’t take the correct answer or times out if you actually read the post.